The distinction between A. flavus, A. parasiticus and A. oryzae is difficult since many intermediate strains occur (13). Both A. flavus and A. oryzae are common contaminants of foodstuffs and less commonly of plant debris (5). A. oryzae is also commonly isolated from soil, wood products and industrial environments (13). Both A. flavus and A. parasiticus are potential producers of aflatoxin (13). Studies from Britain and France found that A. fumigatus was the most common species of Aspergillus isolated from outdoor air (5). Likewise, we occasionally report this species from viable spore samples from outdoor air of the Southern Ontario region. In the indoor environment A. fumigatus is common in trash, house dust and compost (13). Important toxic metabolites of A. fumigatus include gliotoxin, verrucologen, fumitremorgin A & B, fumitoxins, and tryptoquivalins (13). This species of Aspergillus is also an important human pathogen and the most common cause of aspergilloma and aspergillosis (6). Aspergillus niger is a common resident of household dust where its presence has been associated with house pets. This observation may be related to the abundance of Aspergillus niger in outdoor soils. The spores of A. niger are borne in powdery masses which become airborne easily. Like all airborne fungal particulates, A. niger spores may be allergenic, however this fungus is not known to produce any of the profoundly toxic mycotoxins associated with many other aspergilli. While not a noted producer of mycotoxins, A. niger was one of the first micro-organisms to be cultivated commercially for the purpose of extracting of one of its metabolites, citric acid (vitamin C), as an alternative to citrus extraction, bringing about the decline of the lemon industry in southern Italy. The group includes species such as A. ustus and A. puniceus (distinguishable on standardized culture media)(8). Both species may be isolated from soil with A. ustus reported as the more common species of the two (8). A. ustus has also been reported from foodstuffs and plant material (5). Aspergillus versicolor. This species is a common isolate both indoor (13) and outdoor (5) environments. It is commonly isolated from foodstuffs, plant debris, textiles and dung (5). Isolates of A. versicolor are potential producers of the toxins sterigmatocystin and nidulotoxin (13). Aspergillus ochraceusis a common mould genus which contaminated various foodstuffs including spices and coffee beans (13). This fungus occurs commonly in household dust (8). Aspergillus ochraceus is known to produce several important toxic metabolites including penicillic acid, ochratoxin A, xanthomegnin, viomellein and vioxanthin. Aureobasidium pullulans occurs abundantly in the phylloplane where it is a generalist saprophyte. It occurs indoors in areas of free water, such as condensate pans, or as a primary colonist of broadloom following a flood. Because its growth form is yeast-like (and are not forcibly discharged), its cells/spores only become airborne through mechanical disruption of contaminated materials or aspiration of contaminated water. Aureobasidium pullulans is not a primary human pathogen (12) nor is it recognized as a producer of significant mycotoxins (4, pp 130-134). High airborne levels of this fungus have been associated with allergic complaints probably due to respiratory irritation mediated by cell-wall components (e.g. beta glucans, glycoproteins). 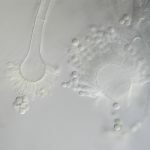 Chaetomium is a genus of sexually-reproducing fungi (subdivision Ascomycotina)comprising a large group of species (e.g. > 200) which are superlative decomposers of cellulose (5). A great deal of the early research on this group was undertaken by the US armed forces during WWI and WWII due to the impact of this fungus on the decomposition of canvas materials. Species of Chaetomium occur commonly both indoors and outdoors on cellulose-rich materials. 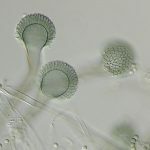 Despite the ubiquitous nature of these fungi and the longevity of their spores, they are not seen commonly in air samples. Cladosporium is a large genus of moulds (approx. 500 species) (5), and includes both plant pathogens and saprophytes (13). Members of the genus were recently reported as the most common fungal isolates from outdoor air in Southern Ontario (as sampled through viable spore methods), accounting for approx. 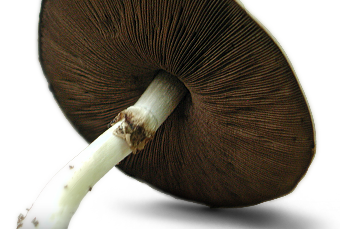 40% of viable, annual fungal spore load (9). Cladosporium cladosporioides is recognized as being among the most ubiquitous and prevalent species of the genus (5). 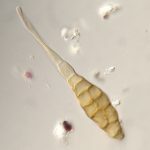 Cladosporium sphaerospermum is also common and worldwide in its distribution and is reported from air, soil, foodstuffs, seeds, paint and textiles (13). We report C. cladosporioides and C. herbarum commonly and C. sphaerospermum infrequently, from viable spore samples taken in the Southern Ontario region. Our investigations suggest that species of Cladosporium species occur frequently, on water-damaged organic building materials, particularly wood, and wood products. However, Cl. herbarum appears to be exclusive to outdoor isolation and is not typically associated with indoor biocontamination (1, p 19. 12). This genus is not known to produce significant mycotoxins. Doratomyces is a genus comprising structurally complex asexual states of members of the ascomycete genus Microascus. The spore-bearing structures of genus Doratomyces are essentially compound or aggregated analogues of Scopulariopsis, a common soil resident and occasional causal agent of toenail infections. Epicoccum nigrum (= E. purpurascens) is an ubiquitous, weak necrotrophic parasite or secondary invader of the above-ground parts of herbaceous plants, particularly grasses (13). This fungus is also known from wet paper, textiles and decaying wood (5). In our experience (as well as others), this is one of the most abundant fungi to occur in outdoor air during the late summer and early fall in southern Ontario (9). Fusariumis a taxonomically difficult mould genus consisting of primarily of plant pathogens and agents of post-harvest spoilage (13). Species of Fusarium are morphological variable and key diagnostic features often remain undeveloped in culture (5). Several species are potential toxin producers (13). Important toxic metabolites of Fusarium spp. include trichothecenes, zearalenone and fumonisins (13). We regularly report isolates of Fusarium from viable spore samples of outdoor air. Geomyces pannorus (= Chrysosporium pannorum) is commonly isolated from a variety of soils (5). Hyalodendron, according to Barron (3) is a hyaline counterpart to the genus Cladosporium. The American Type Culture Collection (2), includes isolates from ‘contaminated’ air (ATCC 28250), beer pipes (ATCC 44977), wood pulp (ATCC 44978) and a building ventilation system (ATCC 96052). We have reported species of this genus only infrequently from outdoor viable spore samples. Mucoris a genus of fungi of the division Zygomycota, characterized by rapid growth and preference for simple sugars for nutrition. Mucor is a common agent of decay of plant materials as well as foodstuffs, usually as an early-stage colonist when water and nutrients are abundant. This genus occurs frequently in soils rich in organic matter. Mucor produces copious powdery spores within fragile sacs called “sporangia” which become airborne with minimal disruption. We regularly observed species of Mucor (especially M. plumbeus), from samples of air and bulk materials from indoor environments. 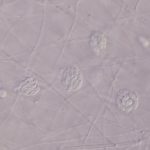 However, in our experience it is rare to observed species of Mucor growing actively on indoor substrata, suggesting that in most cases, the indoor spore-load of this fungus may be due to spores being tracked indoors on soiled footwear or carried in with outdoor air. Nigrosporais a small genus of moulds which are strong decomposers of cellulose (5). Species of Nigrospora are known to occur in numerous soil habitats, particularly where plant debris is abundant. Although Nigrospora has been reported as an agent of decay of indoor materials (5), in our experience it is a very uncommon resident of buildings. Nigrospora produces tiny, black pill-shaped spores which are forcibly propelled into the air from the colony surface (5). Paecilomyces is a genus of moulds closely related to Penicillium subgenus Biverticillium. Spores of Paecilomyces are borne in delicate, unbranched chains which are easily disturbed by air currents or other means of mechanical disruption. While most species of Paecilomyces are common soilborne saprobes, a group of species in this genus are known primarily as parasites of insects. Several species of Paecilomyces are quite tolerant of high temperatures, and as such are common inhabitants of compost piles. Some species of Paecilomyces, notably P. variotii, are known to produce significant mycotoxins (e.g. patulin, viriditoxin). 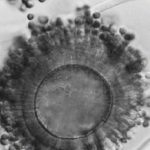 Penicillium is one of the larger and more conspicuous groups of moulds known from a wide variety of substrates ranging from soil to building materials and foodstuffs. The genus comprises over 200 recognized species representing only a small fraction of the projected biodiversity in this group (6). Traditionally, the genus has been subdivided into four subgenera on the basis of microscopic form: Subgenera Aspergilloides, Biverticillium, Furcatum and Penicllium. A seldom employed fifth subgenus, Divaricatum, is roughly intermediate to the subgenera Aspergilloides and Penicillium. While the placement of isolates of Pencillium into an appropriate subgenus is relatively straightforward, at present the reliable species level identification of all but a few of the species of Penicillium is very difficult and requires specialized testing which is impractical and cost-prohibitive in the routine analysis of environmental samples. Some broad generalizations can be drawn from the subgeneric identification of Penicillium. For instance, Penicillium subgenus Biverticillium is mainly restricted to soil habitats, whereas Penicillium subgenus Penicillium contains mesophilic and xerophilic members which colonize a vast array of substrates rich in complex carbohydrates like cellulose-based construction materials and/or proteins such as foodstuffs. As well, Penicillium subgenus Penicillium is associated with the production of significant mycotoxins more than the other subgenera (9). However, specific information regarding habitat and mycotoxin profile necessitates a species-level identification. We recommend species-level characterization of Penicillia only where high airborne concentrations of Penicillia are evident or where there is evidence of an indoor amplifier. Due to the added cost, we undertake species-level identifications of Penicillium where this information is germane and only following client consultation and approval. Some of the most difficult species to identify belong to Penicillium subgenus Penicillium, particularly the P. aurantiogriseum-viridicatum complex (13). Many species of Penicillium are capable of producing one to several toxic metabolites and many such toxins appear restricted to one or few species (13). We have found that Penicillium spp. are common in viable air spore samples of outdoor air. Members of this genus are also common contaminants of water damaged building materials including drywall, wood and wood products. Pithomyces chartarumis a widespread and common colonist of leaves and stems of dead plants (5). A recent study suggests that Pithomyces spp. are a minor but regular constituent of outdoor air, accounting for <0.1% of the annual, viable fungal spore load (9). Rhizopusis a common soil inhabitant and member of the division Zygomycota. This fungus grows rapidly and sporulates abundantly, producing powdery masses of spores borne within fragile sacs called “sporangia” (10). The spores of Rhizopus can become airborne with the slightest disruption of the colony. Rhizopus is a typical colonist of materials rich in simple sugars. 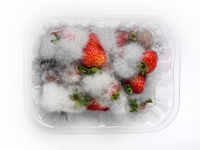 As such, it is frequently observed as a post-harvest spoilage agent on many fruits, especially berries (5,13). Species of Rhizopus are rarely implicated in opportunistic infections of humans (mucormycosis), notably in diabetics and patients with immune system impairment (12). Approximately 24 species are recognized in the genus Sporothrix (5). Some Sporothrix species are the insect-dispersed asexually reproducing stages of the genus Ophiostoma (subdivision Ascomycotina), a relative of the Dutch Elm Disease pathogen(5). Stachybotrys chartarum (= S. atra) is a strong decomposer of cellulose (10) and has been reported as isolated from paper products, textiles, seeds, soils and dead plant material (13). We have reported this species as a common contaminant of water damaged building materials (very frequently from the cellulose layer of drywall, occasionally from pressed (wafer) board, and rarely from wood planks and beams). Isolates of this species are potential producers of satratoxin, a potent mycotoxin (13). Accordingly, it is generally recommended that exposure to this fungus be avoided (13). Tritirachiumis a genus of moulds reported infrequently from soil (3). In addition the ATCC (2) includes isolates from vinyl (ATCC 22334), cotton and nylon (ATCC 22335) and leather (ATCC 22333) products. Ulocladium is a genus of moulds known from a variety of plant materials including both wood and leaf litter (6). It has also been isolated from emulsion paint. We have found Ulocladium spp. to be common in viable, outdoor air, spore samples.